Google isn’t the only company creating useful apps for the web. There are plenty of great online resources not made in Mountain view, provided you know where to look. Here are 12 of our favorite online apps and websites that are worth collecting in your browser’s bookmarks, ready to go at a moment’s notice, to convert files, enhance photos, make GIFs, pick colors, transfer documents and more besides. Let’s Enhance is a slick and free site for improving your low-res photography. Blocky noise is automatically removed and some neural network smarts are applied to imagine missing parts of the picture and enlarge it in a smoother way. You need to create an account to see the end results, and then you get a choice of high-res enhanced variations to choose from. Getting a file in the wrong format is one of the most frustrating experiences of modern-day computing life. Converting them on your computer often requires shady shareware, so the online only Zamzar is a nice, fast alternative. While there are limits on file sizes on the free version (you can pay to increase the limit), the site supports 1,200 different conversion types, including audio, video, image, and document types, all handled in your browser. Services like Dropbox and Google Drive make sharing large files over the web easier than ever, but sometimes you just want to quickly fling a file at someone with no need to register or log in or anything else. 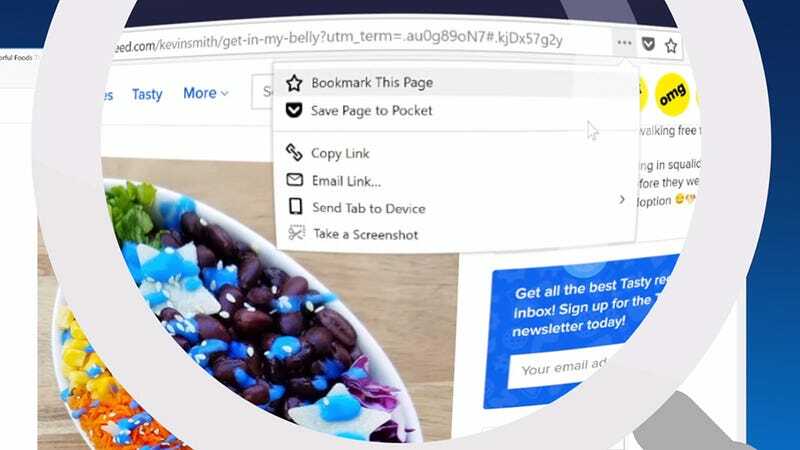 Enter Firefox Send (yes, like the browser), which lets you drop any file into a browser window and send it via a safe, private, and encrypted link. You can look up times in other parts of the world via Google or just stare at your watch and try and figure them out yourself, but if you bookmark TimeAndDate then you can have a series of world clocks up on screen whenever you want—you can pick your cities, and the order, and if you sign up for a free account you can access your clocks from any browser. Got something dodgy lurking on your hard drive that you want checking out? Employ the services of Jotti Malware Scan—you simply upload a file through the web interface, and it then gets scanned in the cloud by a host of applications, including tools from Bitdefender and AVG. It’s particularly useful for checking email attachments before opening them. If you’re eager to watch a particular movie or show but aren’t sure where it’s (legally) available, then Can I Stream It? is a useful bookmark to have on hand. Type in the content that you’ve picked and the site scours Netflix, Amazon Video, Hulu, YouTube, iTunes, and various other platforms to see where you can buy or rent it, as a download or a stream. Don’t panic if you can’t get on to Facebook or Google Docs—at least, not until you’ve checked the status of the portal you’re trying to access via Down For Everyone Or Just Me. Type in the URL, click the link, and you can see whether the site is having problems or you are. You can look up site hosting information and scan for malware problems here too. Everyone loves GIFs, and one of the internet’s best GIF resources also has a creator component that lets you whip up a quick animation from an online video or a file stored on your hard drive. Keep a GIPHY bookmark available in your browser, and you’ll always be able to create a GIF from just about anything in seconds, ready to save to disk or share. Again, sums are something you can do straight through Google, but the Desmos Graphing Calculator is definitely deserving of a spot in your browser’s bookmarks if you’ve got some serious maths to do. A host of functions, equations, and data plotting tools are supported, and it’ll do simple sums too. Use the menu on the left to see some quick example graphs. Plenty of voice recording apps are available, but Clyp is quick and simple, and can be accessed right through your browser whenever you want to jot down an idea with your voice, or send a voice memo to someone else. If you want to be able to save clips to disk or keep them online for more than 24 hours, you need to sign up for a free Clyp account. If you work in design or web development, you’ve got a lot of palette pickers to choose from, but Palette Generator is one of the best online ones we’ve come across. Rather than asking you to seed or scroll through a set mix of colors, it asks you to upload a series of images from your computer—it then generates interesting color schemes to match. Scoreboardz is very simple but very useful: It’s a scoreboard that runs inside your browser that you can bookmark and call up whenever there’s a competition happening in the office or the living room. Enter the names of up to 12 players, choose your scoreboard background, and then simply click to increase or decrease each of the scores.